Near the sequence of waterfalls known as Low Force in Teesdale can be found the present-day incarnation of Wynch (or Winch) Bridge – a shaky-looking suspension affair over a particularly ravinous stretch of the River Tees. The wobbly crossing of today is at least the third version of its kind to have occupied the site. 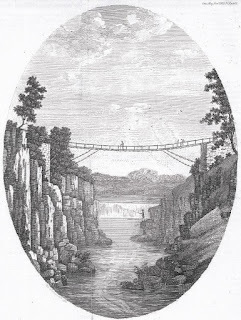 When the first such contraption was thrown across the gorge it was said to have been England’s first chain suspension bridge – and the second in Europe. This was in 1741, and was built to facilitate the movement of the Holwick leadminers from south of the river (old Yorkshire) to their place of work at Little Eggleshope in County Durham on the north bank. Apparently, it only had one handrail and was suspended on hand-forged wrought iron chains – and at 70ft in length and 20ft above the raging torrent, it must have been something of a leap of faith for the individuals concerned. This first bridge was washed away in the Great Flood of 1771, but was replaced by an only slightly more robust-looking second bridge (this time with two handrails). You’ll not be surprised to learn that this one, too, fell apart in 1802, imperilling the lives of several poor souls who happened to be on board at the time. It was a miracle that only one of them was killed. It was patched up and eventually rebuilt again (a little further upstream) in 1830 to pretty much its current design and appearance, with the double handrails and timber platform suspended from iron chains secured to the banks over cast iron columns. It was strengthened further in 1992 … but still wobbles a lot. Note: The old image above greatly exaggerates the height of the bridge above the river. 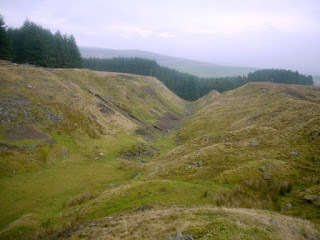 The lead mines in the county of Durham can equal any part of England for a fine and athletic race of men. Removed from scenes of gross licentiousness, and unacquainted with the pernicious practices too generally prevailing in large towns, they inherit sound constitutions, and their bodily frames are strangers to loathsome disease. Their diet is plain and wholesome; but with a sad want of animal food. Frank and free in their manners, kind and hospitable at their homes, remarkable for helping and assisting each other, it is not to be wondered they are strongly knit to their native hills. The average life of a miner is about fifty years. Most of them are subscribers to Westgate and Wearhead libraries; a debating club has also been established, and an instrumental band, lately formed, is a pleasant pastime for those who are skilled in music. The schools, conducted on the old system, are at Ireshopeburn and Burtreeford. The masters in general are respectable and qualified for their situations, though it is highly desirable that more attention should be devoted to an improvement in the manners of the scholars. In this instance, their conduct is shamefully negligent, and it cannot be too severely reprehended. Surely it could not be any hard task to teach and enforce the boys to bow their heads, and the girls to make a modest courtesy, with good morning or evening, to their benefactors or any respectable stranger who may happen to meet them. Could this be accomplished – and there is no apparent difficulty, if laziness could be overcome – it would redound to the credit of the masters, the children, and the dale. It would stamp civility on the character of the rising generation, as what is learnt in childhood is rarely forgotten in after days. A foolish and unseemly custom prevails of inviting to funerals five and six score of mourners. To mention nothing of the expense, it is impossible to prevent hurry, bustle, and confusion. It would be a great boon to Weardale, if some person, more courageous than his neighbours, would set the example and abandon this custom, which is condemned by everyone, and of the folly of which all are convinced. A hearse having now been provided, no plea or justification can be advanced for such a waste of money, or continuance of a custom so ill-befitting the melancholy occasion. There cannot be a more interesting sight than a Weardale wedding. It is customary for the bridegroom’s man to seek the bridegroom and conduct him to the house of the bride. Each young man arrives with a fair partner, and from ten to twenty couple, gaily dressed, assemble on this happy occasion. The older people assist to wait upon them, and they breakfast first, so that they may be at the altar ere the clock strikes twelve. The priest having performed the ceremony, and all being duly signed, the party make to an inn, the landlord or landlady of which has had previous notice to provide cake. Four or five hours are spent in drinking wine and punch; a fiddle is in attendance, and many a merry joke and airy jig have they. The gloves and expenses at the public house are paid by the young men – the bridegroom being exempted according to usage. They then set off arm-in-arm to the groom’s house, where a substantial supper is provided, and ale and spirits are handed round till all are satisfied. Then away they go again to the nearest tavern, where most part of the night is past in carousing, dancing, and merriment. Ale and spirit drinking is the cardinal failing of the men of Weardale. This cannot be disputed – as witness the waste of money – the frequent fightings – the loss of work – the disordered body – the remorse of conscience – torn clothes and bloody shirts – late hours and distressed friends – with a number of other ills. Of all the vices which belong to us, this is the first we should try to overcome. Into this error, I confess, I have too frequently fallen, without any plea to offer in justification. Unfortunately there are too many of the same description. Even if country life, particularly in winter, be gloomy and solitary, and company be oftentime to be sought for in the tavern, it is a paltry excuse, and will not bear the test of next morning’s reflection. It is my firm and decided, because well considered, opinion that, be the yearly pays ever so good, Weardale will never be in a reasonably prosperous state till this foolish and expensive practice be considerably diminished. We drink and spend in days as much as would serve some people, in other countries, weeks; though let it be mentioned and borne in mind that there is no systematic tippling among us as there is in towns. 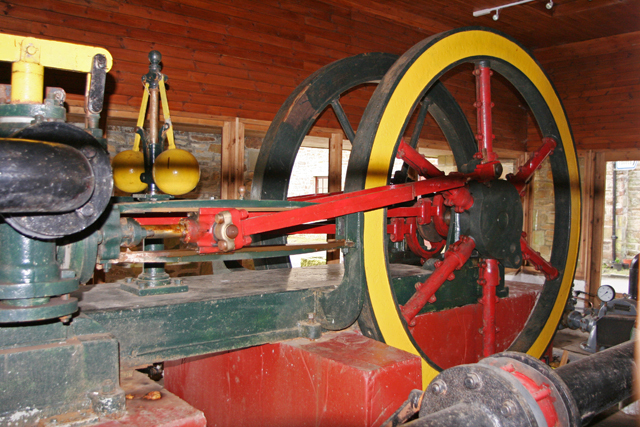 The chief attraction of Allenheads Heritage Centre is the recently restored Armstrong Hydraulic Engine, pictured above – or, to give it its full title, the ‘W.G.Armstrong twin cylinder, double acting hydraulic engine’. It was made and supplied by the famous industrialist for his friend, the almost as well-known Thomas Sopwith, who at the time was agent of the town’s lead mine. The water-powered mechanism was one of several that ran machinery in the mine’s yard, primarily the saw-mill and the ore crusher. Installed in the 1840s*, it was fed by Spring House and East End reservoirs high in the hills above the town – and remained in service, remarkably, until 1960. After lying unused and then derelict for a couple of decades, it was rediscovered in 1986 and subsequently restored to full working order. It is believed to be the last remaining engine of its kind in the world. * The installation date of the engine does not seem to be precisely known. Some sources give this as early as 1846, but as Armstrong’s mighty Elswick Works in Newcastle were not founded until 1847, this seems unlikely. Sopwith’s diary entries for 1856 indicate that Armstrong’s ‘hydraulic machines’ had by then been up and running for some time.